A gap is an unfilled space or interval. On a chart, a gap represents an area where no trading takes place. There are 4 types of gaps, excluding the gap that occurs as a result of a stock going ex-dividend. Breakaway gap – occurs when prices break away from an area of congestion. When the price is breaking away from a triangle with a gap then it can be implied that change in sentiment is strong and coming move will be powerful. One must keep an eye on the volume. If it is heavy after the gap is formed then there is a good chance that market does not return to fill the gap. When the price is breaking away on a low volume, there is a possibility that the gap will be filled before prices resume their trend. 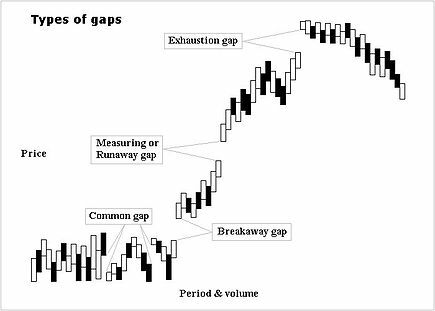 Common gap – (or area gap, pattern gap, temporary gap) tend to occur when trading is bound between support and resistance level on a short span of time and market price is moving sideways One can also see them in price congestion area. Usually, the price moves back or goes up in order to fill the gaps in the coming days. If the gap is filled, they offer little forecasting significance. Exhaustion gap – signals the end of a move. This gap is associated with a rapid, straight-line advance or decline. A reversal day can easily help to differentiate between the Measuring gap and the Exhaustion gap. When it is formed at the top with heavy volume, there is significant chance that the market is exhausted and prevailing trend is at halt which is ordinarily followed by some other area pattern development. An Exhaustion gap should not be read as a major reversal. Measuring Gap – also known as a runaway gap, formed usually in the half way of a price move. It is not associated with the congestion area, it is more likely to occur approximately in the middle of rapid advance or decline. It can be used to measure roughly how much further ahead a move will go. Runaway gap is not normally filled for a considerable period of time. It is possible that confusion between measuring gap and exhaustion gap can cause an trader to position himself incorrectly and to miss significant gains during the last half of a major uptrend. Keeping an eye on the volume can help to find the clue between measuring gap and exhaustion gap. Normally, heavy volume accompanies the arrival of exhaustion gap. Some market speculators create the gap on the opening of a market. In this case fill the gap probability on any given day is around 70%. Once the probability of “gap fill” on any given day or technical position is established, then the best setups for this trade can be identified. Some days have such a low probability of the gap filling that traders will trade in the direction of the gap.